Performers include: Eric Dane, Adam Baldwin, Rhona Mitra, Charles Parnell, Christina Elmore, Michaela McManus, Sam Spruell, Travis Van Winkle, and Tracy Middendorf. Co-produced by Michael Bay, this dramatic TV series is based on a novel of the same name by William Brinkley. After a global pandemic wipes out 80% of the world’s population, the USS Nathan James (DDG-151) stands as the lone unaffected US Navy ship. The 217 men and women on-board this guided missile destroyer must try to find a cure and stop the virus in order to save humanity from extinction. The ship is captained by Commander Tom Chandler (Eric Dane). Other characters include executive officer Commander Mike Slattery (Adam Baldwin), paleomicrobiologist Dr. Rachel Scott (Rhona Mitra), command master chief Hugh Jeter (Charles Parnell), Lieutenant Alisha Granderson (Christina Elmore), Lieutenant Jackie Makena (Michaela McManus), paleomicrobiologist Quincy Tophet (Sam Spruell), SEAL team leader Danny Green (Travis Van Winkle), and the captain’s wife, Darien Chandler (Tracy Middendorf). What do you think? 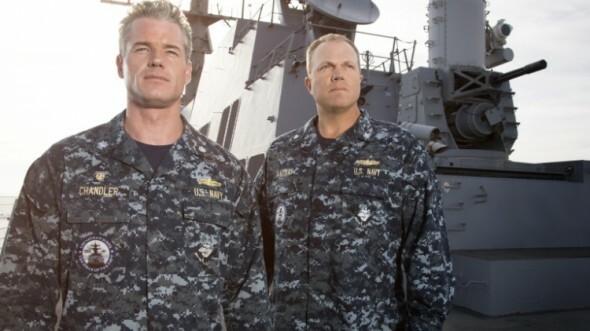 Do you like The Last Ship TV series? Do you think it should have ended or been renewed for a sixth season? If this show had to end because of the books ending, I understand, but to continue the Nathan James after see ”her’ sink off the coast of Colombia, then the Nathan James II could continue a new Season with very good writer and hopefully the same cast. This show was a hidden gem and sorry to see it finish. I give this show a number ten. Great show would like to see more. Something like this could actually happen. I love the Characters in the series. Please continue. Excellent show I wonder how the Gods of entertainment decide to end or continue a show. This was a wonderfully written spectacle. I don’t know why TNT cancelled this one. This was one of the best shows I have ever seen. Please bring it back.